We're going to split Alerts and Messages into separate badges + dropdowns, in T108190: Split notifications into Alerts and Messages. The "Username left a message on your talk page" notification currently in Alerts makes more sense in Messages; let's move it there. 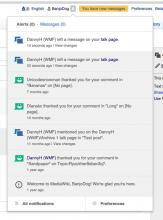 DannyH added projects: Collaboration-Team-Archive-2015-2016, Collaboration-Team-Triage, Notifications. @DannyH @Quiddity That patch also clears the newtalk flag (the one that triggers the Orange Bar of Death) if you mark all your Echo edit-user-talk notifications read. I thought syncing it in that direction made sense. We might want to sync in the other direction as well. Absurd. 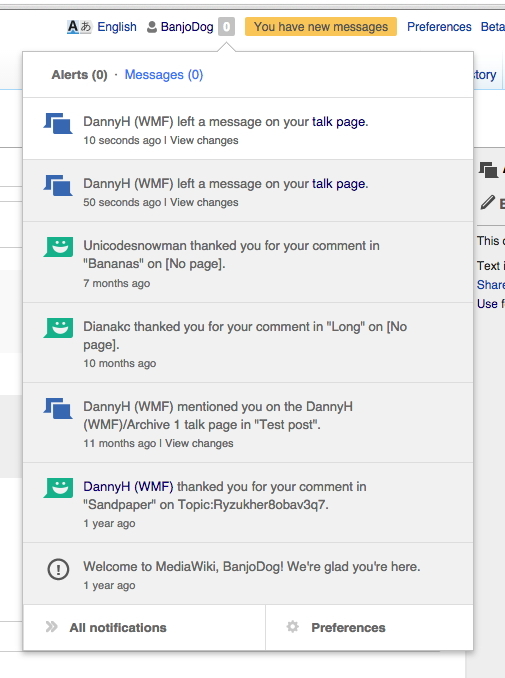 People expect talk page messages to be read immediately. People expect messages to be in the "Messages" tab, I am quite sure. The name "Alerts" is a bit weird now that everything that's actally important/urgent is moved to Messages. Maybe it could be renamed to Notifications? That's a fairly standard term, Facebook and Linkedin use it for example. Closing the ticket, also noting the feedback. We'll be looking for more feedback once these changes are live.